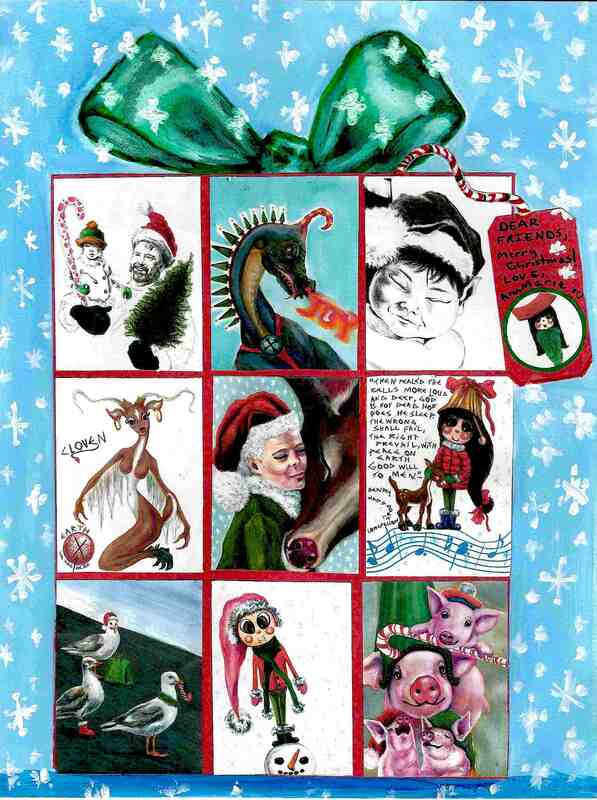 This entry was posted in My Art & Writing and tagged art, children, Christmas, free verse, gifts, holidays, humor, inspiration, lyrics, movies, musis, shopping, spirits, writing. Bookmark the permalink. Thanks John. A happy and healthy to you and yours, as well. Merry, merry, John – see you close or after 2016! “. . .sitting on my heart all day”. . . what a great metaphor (at least I think so). I’m going to tuck that one away and will credit you when used…..Merry Christmas a few days early. Merry Christmas to you as well – and feel free share words whenever the mood suits you – I’d be honored. Beautiful Work AnnMarie! Hope Santa Brings The Delicate Daughter lots of gifts this year and she feels better soon! As well as the Big Son and The Giant Husband! Your welcome AnnMarie. I am glad to hear that.I have a sneaking suspicion I will be spoiled this year too I wrote Santa a very long list and mailed that letter a month ago. I think more than the gifts getting a christmas card from Sammi after two years of out of touch, reconnecting with Ashley after 5 months and my AnnMarie story are my favorite parts of this Christmas this year more than any gift. It’s better to give than receive and holidays are best when spent with friends and family. What a delightful, montage gift of your creative spirit. Activities pre-holiday and a wonderful 5 days in NC, called Cousins’s Week by the 5 grandkids…and now a quiet Christmas Eve and day….started this morning with this wonderful collage and Christmas giggles. Have a Merry Christmas with your beautiful family. I’m leaving for PA shortly – just waiting for the big son to finish getting ready. He had wrestling practice this morn. Edified and re-blogged at https://villageundertaker.wordpress.com/2015/12/29/metaphor-of-the-week/ Happy New Year.